Load the cassette, then thread the tongue? Now look: millions of rolls of 35mm film have been loaded this way, and hopefully it works for you too. Now that my earlier post warned you away from some vintage 35mm SLRs you should avoid, what’s left? I won’t inflame any fanboys by trying to proclaim “the greatest film SLRs of all time.” But what I think most people need in a film camera today is a something that’s not too enormous, not too expensive, and covers all the basics with a bit of style. You also want an SLR where the lens options are plentiful, which rules out a few niche brands. Our first batch covers cameras where the exposure settings are entirely in your hands. You’ve got a built-in light meter to consult (maybe moving close to the subject for a more accurate reading), but after that—it’s all up to you. If you want to take photography back to real hand-crafted basics, start here. Click any camera for a closer look. We’ll be back in a few weeks to look at the grooviest autoexposure models you might consider. Why it’s great: I have to start with this one: The SLR which upended a whole industry by being so tiny, lightweight, and elegant. And the matching OM lens lineup is just as svelte and lovely. Only a simple needle intrudes into a viewfinder image which seems impossibly large and bright, given the low profile of the pentaprism housing. Relatively quiet shutter. Mirror lockup option for vibration-free shots. Timeless styling. Versions & cousins: The very earliest version lacked connections for a motor drive (and so is missing the “MD” badge to the right of the lens). The slightly revised OM-1N has some small improvements, and means the camera is a few years younger. 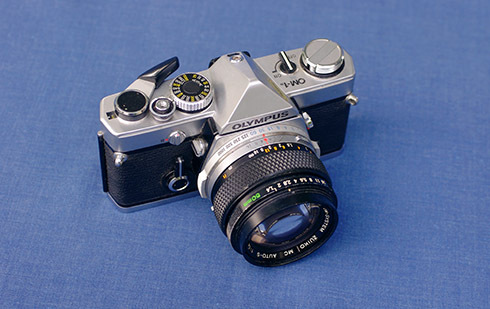 The near twin OM-2 (& OM-2N) add aperture-priority autoexposure.